Pictured with the 1st prize Mule hoggs and lambs are, from left, Jonathan Guy, of JG Animal Health, co-exhibitor Robert Johnson, judge Mike Allen, co-exhibitor Raymond Johnson, Gareth Jones, the British Wool Marketing Board’s producer relations manager Gareth Jones, his colleague Lauren Boulton, and Chris Rowan, manager of the grading department at Bradford-based North of England Wools. As in past years, the thriving ringside included strong representation by purchasers from a wide area, all keen to strengthen their flocks with some quality outfits from right across the region. They had plenty of choice among the 505 sheep with 710 lambs, and 315 geld gimmer hoggs. Stuart Beeforth, of Fellside Agricultural Services, Stillington, York, marked his debut in the show class for Continental-cross hoggs and lambs by taking first prize honours with his pen of five Beltex, all with single lambs, which went on to head the day’s prices at £280 per outfit when joining Lincolnshire buyer T Ogg, of Coleby. It equalled to the 2011 top price. In the same class, John Stapleton, of High Skibeden Farm, Skipton, just failed in his bid to land top honours for the third year in succession when taking both second and third prizes with pens of Texel-cross hoggs with single Texel-cross-Beltex lambs. The runners-up joined Cheshire buyer D J Jackson, of Ashton by Budworth, Macclesfield, for £240 per outfit, the fourth year running he has purchased leading performers from Mr Stapleton. However, they were outperformed by the third prize pen, which made a breed-topping £252 each when knocked down to A Lawson, of Tadcaster. Father and son farmers Raymond and Robert Johnson, of Summerfield Farm, Felliscliffe, Harrogate, best known for their many successes in the Craven Dairy Auction show arena, were represented with their usual good run of sheep at this time of the year, taking the red rosette in the pen of five Mule hoggs with single lambs show class, which also headed the prices at £240 per outfit when selling locally to Tony Clay, of Airton. The second prize pen from Richard Hanson, of Westow, Ryedale, sold for £225 each to H Smith, of Selby, with the third prize pen from D Sunderland, of Halton East, achieving £195 per unit when finding pastures new with SB Harrison, of Leyburn. In the show class for pens of ten geld hoggs, all three prizewinning pens sold to the same buyer, David Norcott, of Knutsford, Cheshire. He paid £150 per outfit, top price in class, for the first prize winners from Jerry Horn, of Dotcliffe Farm, Kelbrook, £132 for the third prize pen from the same exhibitor and £128 for the runners-up shown by C Hall, of Whixley, York. In the same class, the best of the Texels at £140 per head were presented by John and Alison North, of Fenwick, Doncaster, while R Nutter, of Fence, Burnley, had the top price Swaledales at £100 each. In the Mule shearling and lambs show class, first and second prizes fell to Red Rose vendor Paul Keyes, of Salwick, Preston, both outfits selling at £232 per unit to Harold and Andrew Lee, of Lothersdale. Richard Umpleby, of Killinghall, Harrogate, achieved a top price double in the hoggs with single lamb classes with Zwartbles at £185 and Suffolks at £180, while his Suffolk hoggs with twin lambs were also a top-priced £190 per combination. Leading performer in the class for shearlings with single lambs was L Simpson, of Pateley Bridge, with a pen of Texels that made £168 per unit, while Thomas Boothman, of Linton, presented the top price pen of Texel shearlings with twin lambs, along with the top price pen of Suffolk two-shear ewes with twin lambs. Both pens sold at £230 per outfit. Taking top price honours in the ewes section by some margin were renowned Beltex breeders Martin and Val Brown, of Beechwood House Farm, Newton-le-Willows, Bedale, who sold their pen of females with twin lambs for £262 per unit. Also notable at £208 per outfit were the top price Texel two-shear ewes and twin lambs from AP & D Sowerby, of Hawes, with other leading breed prices as follows: Mule ewes, broken mouthed, with twins – E Fairburn & Son, Thornton Stewart, £175; Beltex ewes with singles - G Fairburn, Apperley Bridge, £142; Mule ewes, broken mouthed, with singles – V Clarke, Bradford, £132. 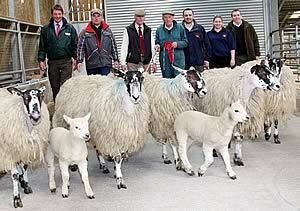 Average prices: Geld hoggs - Texel £116, Mule £107, Swaledale £87. Hoggs and singles - Suffolk £160, Texel £183, Mule £208, Beltex £255. Hoggs & Twins - Suffolk £190,Texel £185. Shearlings with singles - Texel £136. Shearlings with twins - Texel £215, Mule £218. Mike Allen, of Saltburn, Whitby, judged the hoggs classes, with James Spensley, of Elslack adjudicating with the ewes. Sponsors were JG Animal Health, the British Wool Marketing Board and Farmway.